After months of toil and the heroic efforts of my talented artists, the Scarlet Heroes Kickstarter is now live. The game of one-on-one old-school adventure is now ready to be backed, downloaded, and played. Backers who pledge for the game will be able to immediately download the layout and text-complete PDF. As soon as you pledge, you’ll be able to download the game and start reading- and start playing shortly thereafter. The rules are as compact as you can expect from a Sine Nomine game, but it’s also fleshed out with plenty of system-neutral helps and tools for building adventures and spinning out some solo play. These Kickstarters can be fearfully stressful things, so I can’t really understand how anyone would want to start one without actually having finished everything they could possibly do before they started taking money. I’ve done everything I can, and thanks to the agile pens of Luigi Castellani, Nate Furman, Dyson Logos, Ian MacLean, Earl Geier, Joyce Maureira, David L. Johnson, Eric Lofgren, and Miguel Santos I’ve been able to get 42 out of 62 illustrations complete before the KS has even started. Their hard work is impressive- and fast. So fire it up and give it a try with your spouse, kid, or friend who’s curious about old-school RPGs. 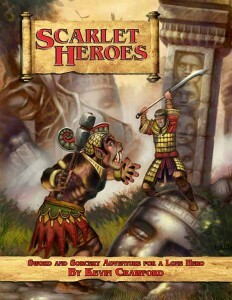 It can be tough to find the time to pull together a full gaming group these days, so Scarlet Heroes is here to make your gaming a little more amenable to your available time.